The Ontario Dietitians in Public Health (ODPH) is the independent and official voice of Registered Dietitians working in public health in Ontario. The society's mission is to provide a leadership forum and official voice for public health nutrition practice in Ontario. 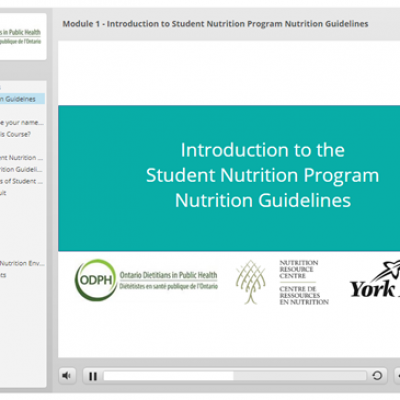 New Online Learning Modules to Raise the Bar for Student Nutrition Programs! These online learning modules were created to support schools and community locations provide nutritious breakfast, morning meals, lunch and snacks to children and youth to support their learning and healthy development. The online modules will help the user to understand the Ministry of Children, Community and Social Services (MCCSS) Student Nutrition Program Guidelines (2016). Check them out here ! Hello ODPH Members , FYI - ODPH Executive sent a press release to our contacts in March linking our name change with Nutrition Month. " Ontario Dietitians in Public Health urge Ontarians to Unlock the Potential of Food this March!" Ontario Dietitians in Public Health logo revealed! New Nutrition Resources for Child Care Settings have been released!